Land surveying teams are benefiting from sophisticated tablet technology that combines collection, real-time data access, and a plethora of other utilities in a mobile environment. Surveyors are able to interact with their data to obtain realistic, multidimensional knowledge of the survey area. Essentially, tablet technology has revolutionized how field surveyors operate, allowing them to work smarter and faster. Here is a look at how surveyors are using tablets for field work boosts project efficiency. These tools enhance productivity in the field with applications that help withteam and asset management, mobile workforce routing and field service scheduling. Surveyors can review the progress of other teams, send out messages, and answer emails from individuals back at the office. Mobile devices offer a variety of handy tools, such as calculation and productivity apps, which helps to increase onsite efficiency. Essentially, many of the tasks that would have to wait until the surveyor got back to the office (or at least back to an internet connected computer) can now be performed with a tablet in the field, greatly cutting down turnaround times on projects. Augmented Reality (AR) is a potentially dynamic view of real-world information enhanced by computer resident data that includes sound, graphics, GPS data and video. This technology is becoming more widely used by surveyors since it allows them to get a clearer view of a project and make better recommendations. In AR, targets become registration points that orient the tablet to the identical point where construction is occurring. As targets are scanned, the original design of the construction is displayed. This view updates as location changes. Visualization is an extremely important part of augmented reality. In a proposed site development, ease of access for large installations can be determined and reviewed in 3D to foresee how any phase of project construction can be best accomplished with optimal access and best fit. Trial and error belongs to the model world when problems can be solved virtually. 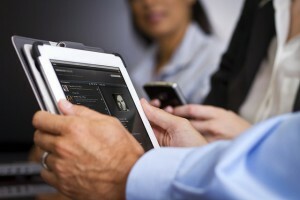 Tablets show exactly what a project will look like at any stage of development, provided the data is available. Building Information Modeling (BIM) is a target resource utilizing AR. It provides improved visualization and information retrieval, as well as the ability to coordinate project documentation. The ability to embed and link vendor specific data, location details, and quantities required for estimation and tendering is invaluable to project efficiency. When paired with other surveying technology, tablets can dramatically increase a surveyor’s productivity and further improve turnaround time. One good example of this is when tablets are paired with 3D laser scanners. With 3D laser scanning, points are scanned at 2mm intervalsby the scanner’s high resolution digital image and are then colored according to the photo. Scan stations are set up in multiple areas for comprehensive data collection. When GPS is associated with data scanned, it can be tied to a local coordinate system. With the latest laser scanning techniques, it becomes possible to convert three-dimensional surfaces into highly accurate mathematical models, which can be viewed on the tablet device. This means that a surveyor can utilize 3D scans, upload the information to the project management site and then review that data on the tablet. 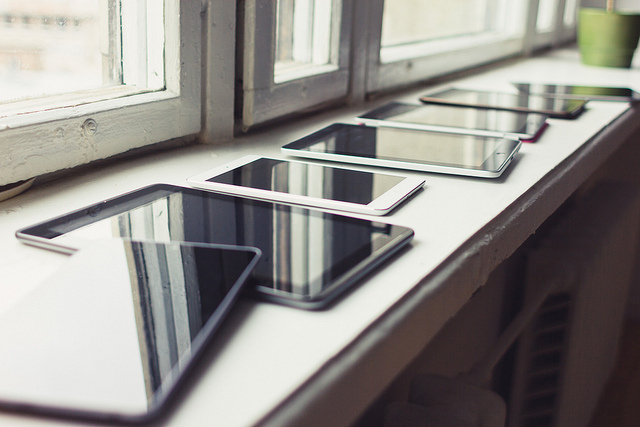 Overall, when tablets are used for field work, project managers can enjoy better data collection, decision making, problem solving, and accuracy. To learn more about how the latest land surveying technologies can benefit your business, please contact us.